Like a number of people in the village of San Roque, we like to take care of a pig or two to fatten. The quality of meat from home-grown backyard pigs is enormously better than those from commercial factory farmed pigs. 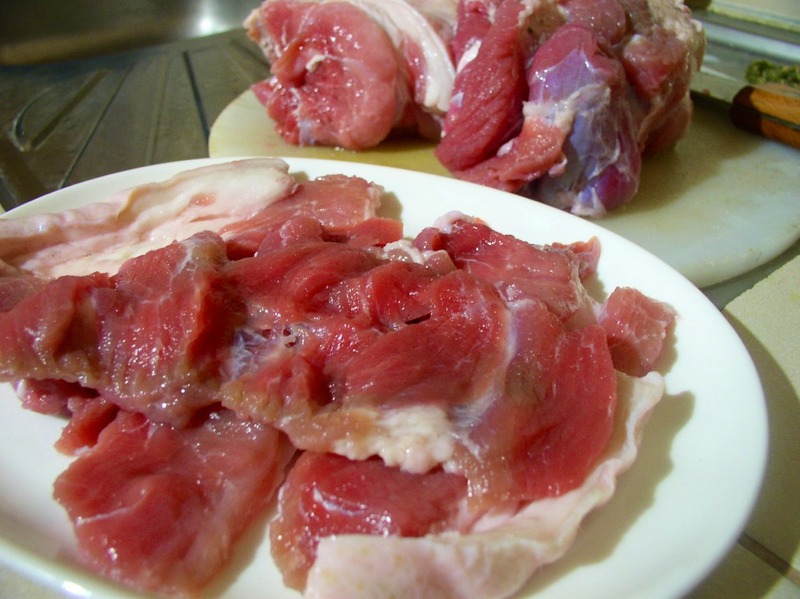 I have noticed that pork bought at supermarkets are very soft and tasteless. There is also often a tendency for the meat to exude a large amount of liquid and shrink considerably when it is cooked. I have observed this same phenomenon when cooking bacon bought from the supermarket. This is very frustrating. Below is a gallery of photos of some of the pigs that we have raised in our backyard. Our first pig for fattening, raised by Penny from April-December 2010 and weighed just a little over 100kg. 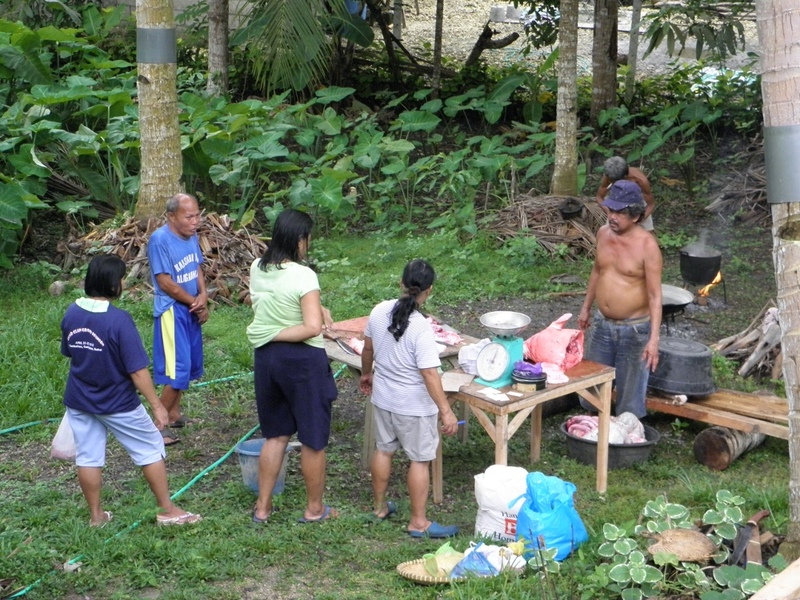 To celebrate Baclayon Town Fiesta last December 8, 2010, our first fiesta at home, Trevor gave Penny some money to buy a piglet and take care of it until it became big and fat. 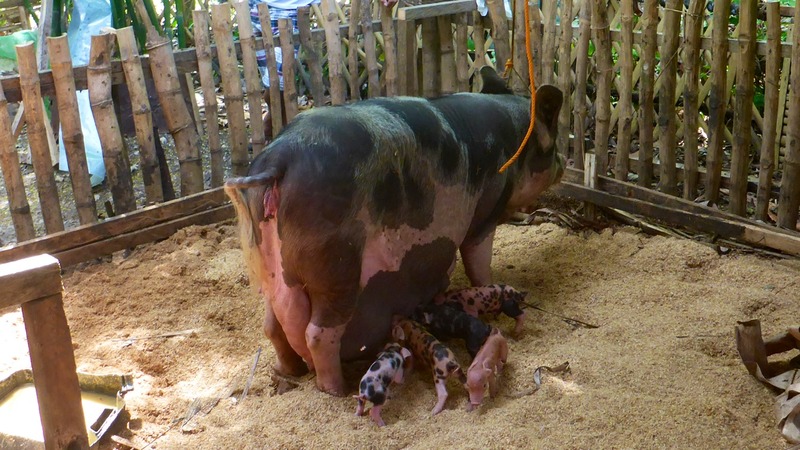 During that time, it would cost some 1,500 to 2,000 pesos to buy a piglet at the Public Market. There, every Market Day (Wednesday), pigs and goats are brought in from various places in Bohol. The piglets are placed inside sacks, so when one buys a piglet, one doesn’t really get the see the whole piglet. It’s quite a lottery. Thus the English colloquialism, “never buy a pig in a poke.” So, when one buys a piglet in a sack, one should take the effort to know who is selling the piglet, and then get a ‘warranty’ in case the piglet becomes ill. The pig can be returned and replaced with a new one. This ‘warranty’ is usually good for one week, that is, until the next Market Day. 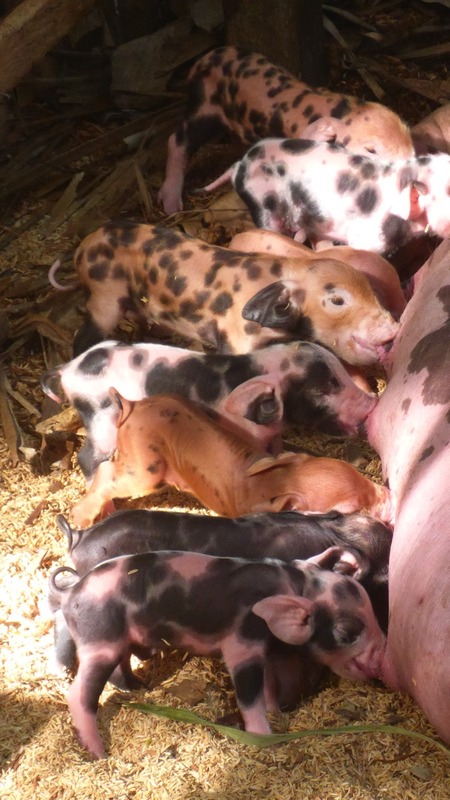 Piglets are often sold at the public market when they are weaned at 4-6 weeks. 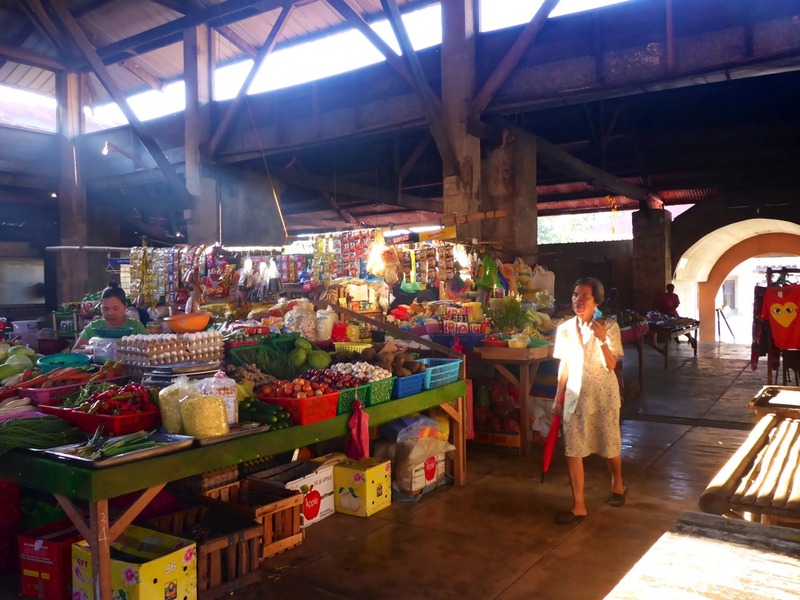 The Baclayon Public Market, peaceful on ordinary days, a great center of trade on market days – since the Spanish colonial period! Penny was quite lucky with this pig. She got it in June, and it grew to reasonable size in about 6 months. The typical scheme here is that someone provides the money to buy the piglet, and the caretaker feeds and looks after until it reaches butcher weight, maybe from 80-100 kilograms. When the pig is sold the person who invested in the purchase of the piglet gets a third share. Normally, that’s about the price of the piglet plus 500 to 1,000 pesos. It’s not a big profit. 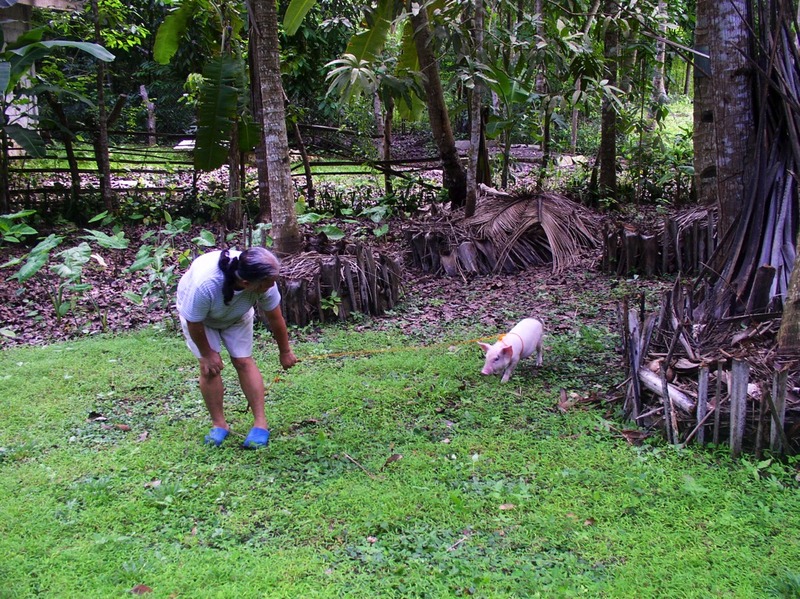 Penny doesn’t get a big profit either, from 1,000 to 2,000 pesos, although that also depends on how resourceful she is in getting food for the pig. 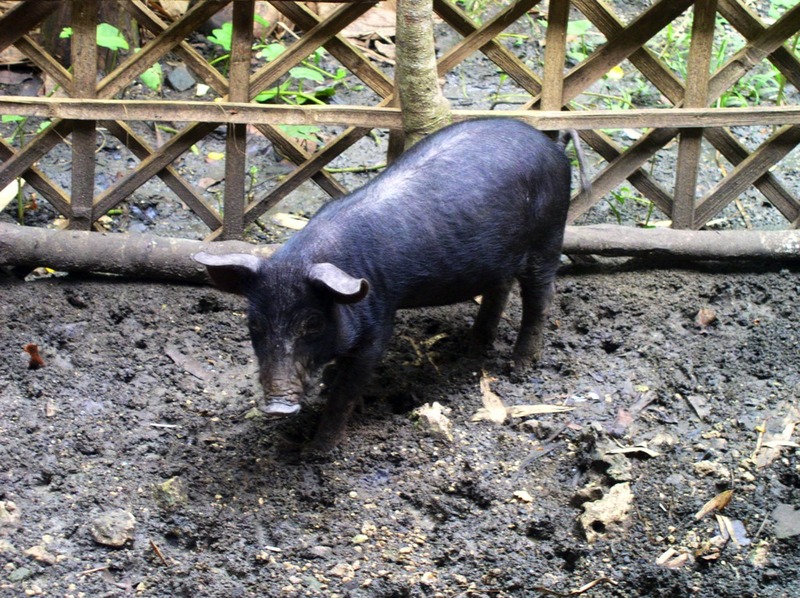 One can buy commercial pig food and supplement that with table scraps, gabi (taro) roots and leaves, chopped up young banana trunks, and various other vegetation. This third-share also applies to sows raised for breeding. 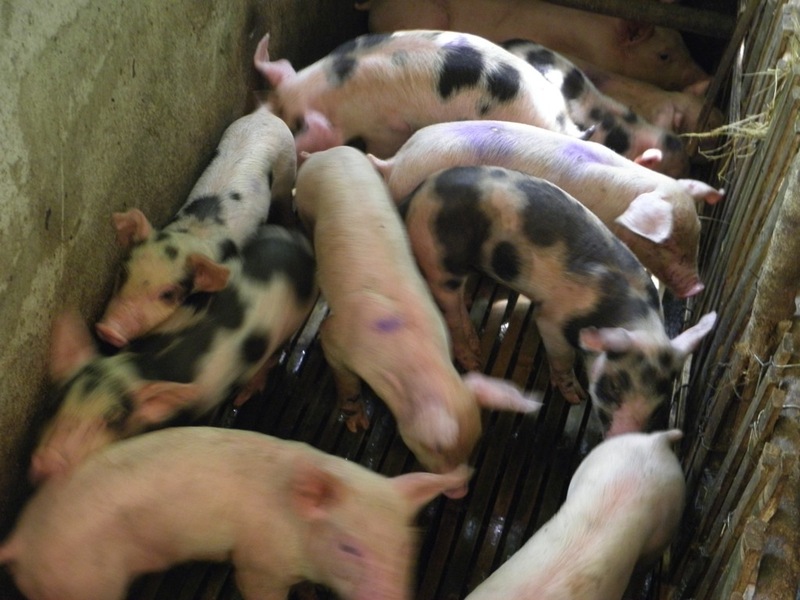 The investor gets a third of the sale of piglets, and the caretaker gets two-thirds. I also learned that with such simple pig schemes, the profit is not that important. What seems more important is getting a large lump sum after the sale of a pig, whether it’s a loss, break even or a small profit. Of course, there is also the enjoyment of looking after a pig which is itself priceless. So, for fiesta, we bought this pig from Penny, less our third share. 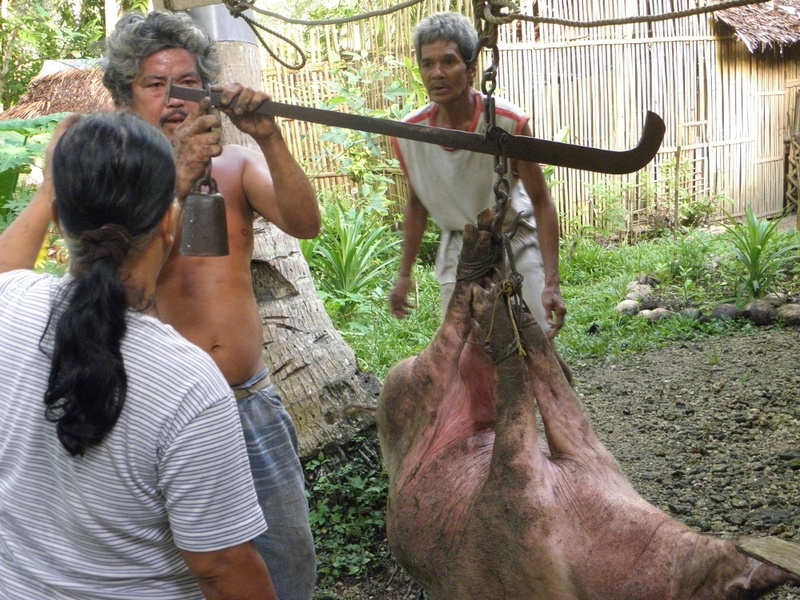 At that time, a pig’s live weight costs from 90 to 100 pesos. Depending on demand, that can now get up to 115 to 118 pesos, maybe more. One might get more profit if one slaughtered the pig and sold the meat. However, it isn’t easy selling meat around here; one needs to be patient and know who to sell to. Most people buy on credit and it can take a long time before one gets paid, if at all. 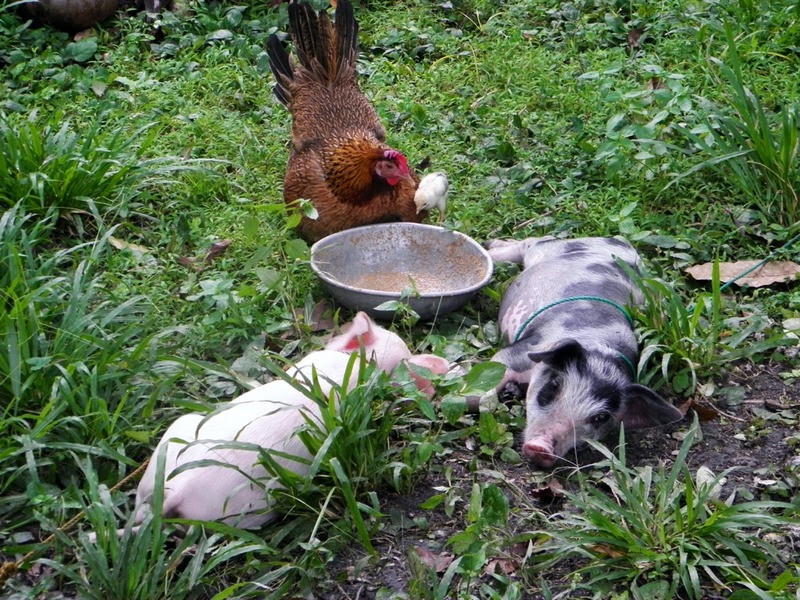 Perhaps the best situation is to keep two backyard pigs – one for one’s own food and the other to sell. They say three pigs is even better. Bebe cutting up the pig into smaller pieces – it is cut in pieces suitable for cooking into popular fiesta dishes such as humba and menudo. In 2011 we got a black native pig. 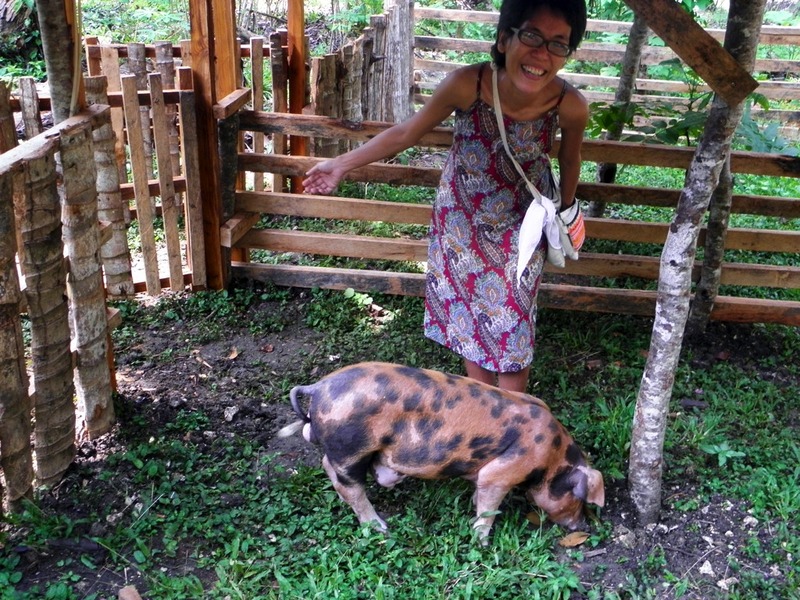 Early 2011, we got our own pig, a native pig, from the market. 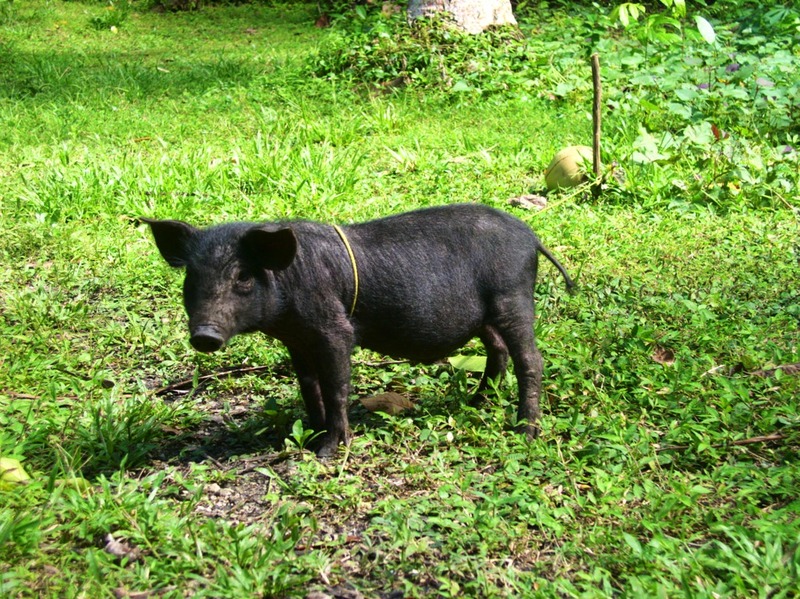 Philippine native pigs are known to be hardy and easy to raise because they can eat all sorts of vegetation. However, after several months, our native pig died. The day before the pig died I noticed that its urine was tinged with blood. 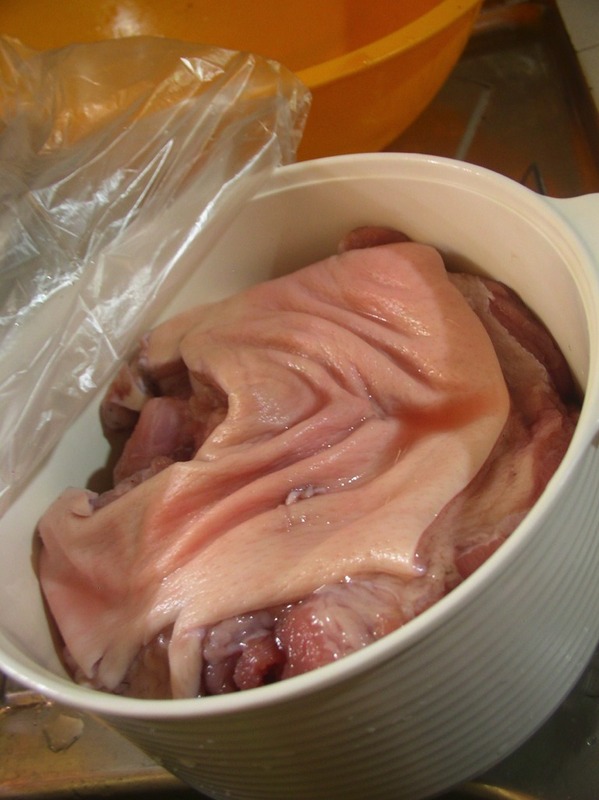 When Bebe cut open the pig after it died, he found a tumour growing in its urinary tract. Such problems may be genetic or due to in-breeding. We have also suspected problems with water because the pig has been finding its way in areas in the garden where grey water from the house flows through. It is possible that the pig was affected by this water over several months. So now we have laid down pipes under the ground and into a makeshift filtering tank (resembling a septic tank) so no animals may access this grey water. Update: In June 2018, we found a way to put our greywater to much better use! See our DIY Wastewater Treatment! 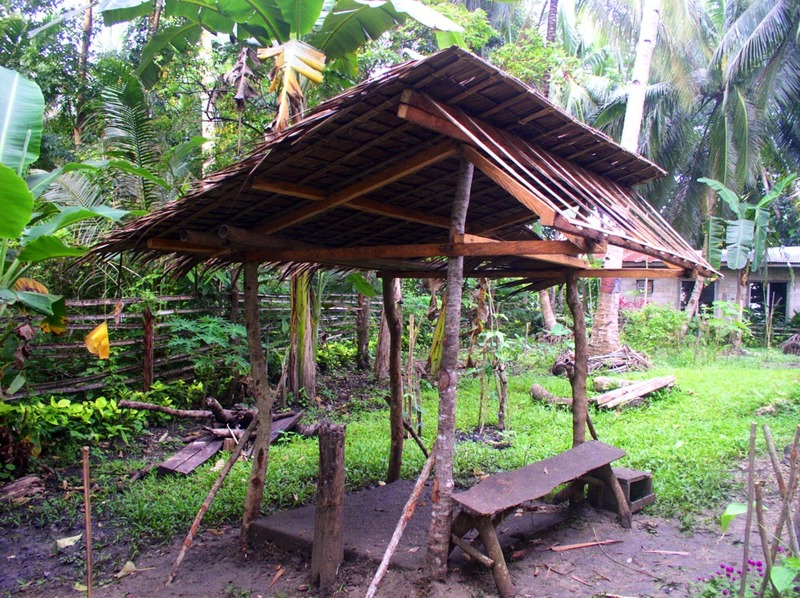 Building a nipa roof over the old pig pen. The finished pig pen next to the dirty kitchen. Later we decided to make this pig pen a bit bigger. The native pig in the newly repaired pig pen. Update: In June and September-October 2017, we rebuilt the pigpens to allow the pigs more room and ease of maintenance. 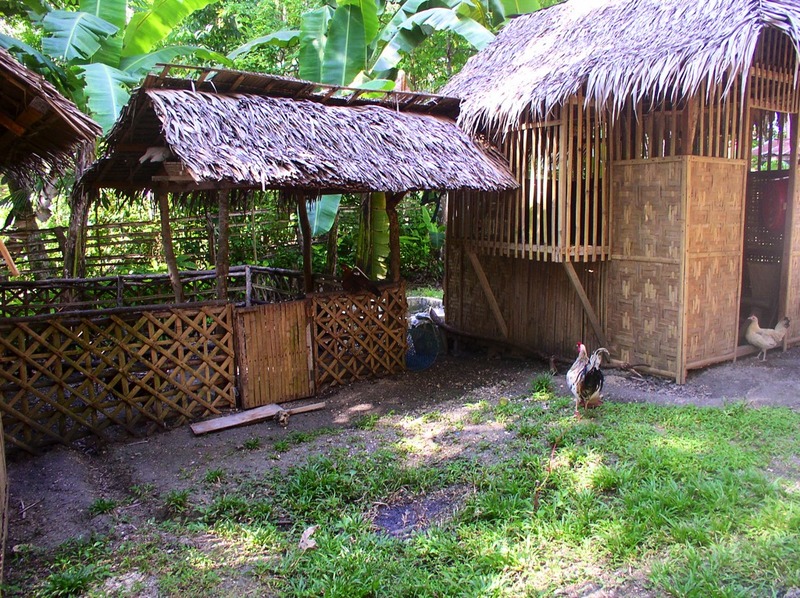 See Natural Housing For Pigs and A Better Pig Accommodation. In June 2013, we got another piglet from the market. 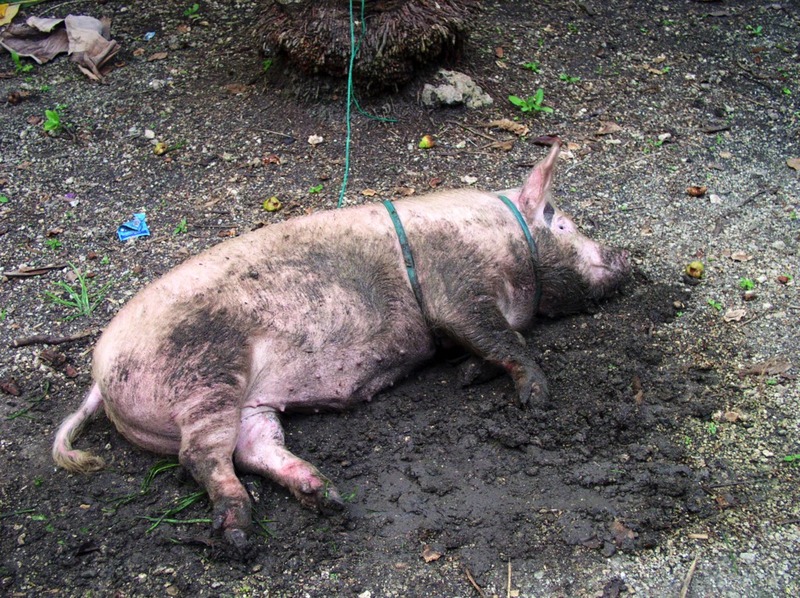 After six months, the piglet grew to about 95 kilos and was butchered for town fiesta. And because there was so much meat, we decided to sell some to our neighbours. Although there isn’t a great profit in this, everyone gets good meat and a small bit of money returns to cover the cost of raising pigs. The garden was turned into an abattoir and meat shop. Our neighbours came to buy fresh meat. Penny kept records of who bought and who owes us money. Here’s Penny’s weighing scale. I will need to get my own soon. 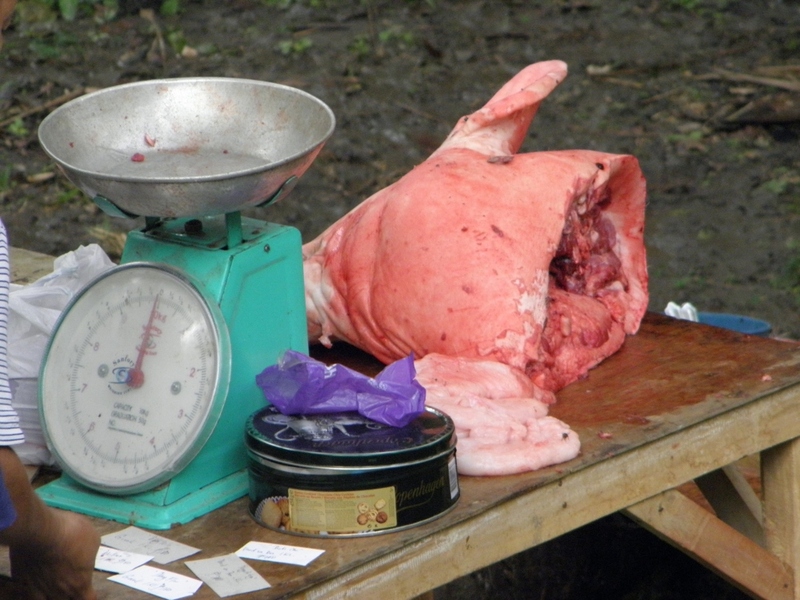 As for weighing large live pigs, there’s a mammoth antique weighing scale at the market. Someone in the village also has an antique hanging balance weighing scale which we borrowed once to weigh our pig. Here’s the antique weighing scale we borrowed to weigh our pig. This is called “espada” which means “sword” in reference to its shape. This could weigh up to a hundred kilos. In February 2014 we got two piglets from the market. Our plan was to keep the spotted piglet as a sow and the other for food. After about six months, the pig grew to about 80 kilos, not very big. I decided to keep half of the meat and I gave half to Penny for the village fiesta. 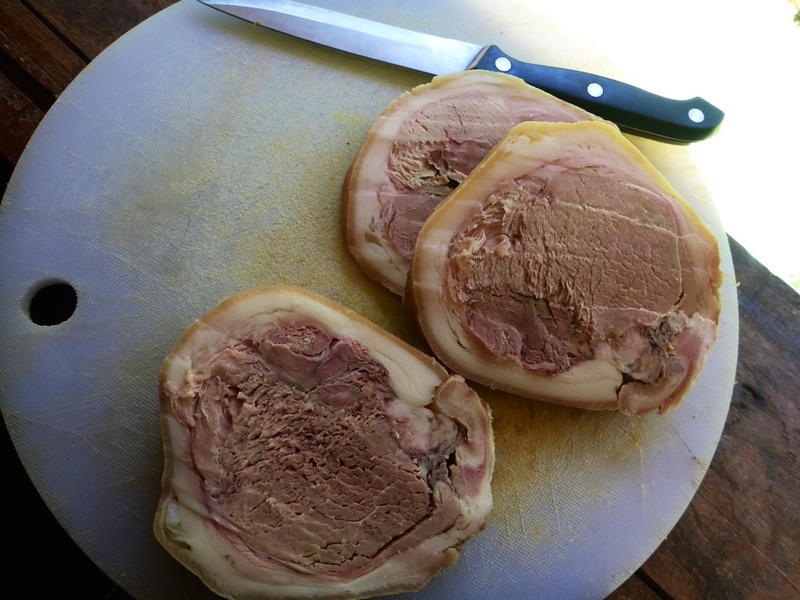 Here, I made some cooked ham from the meat. It was very good meat! 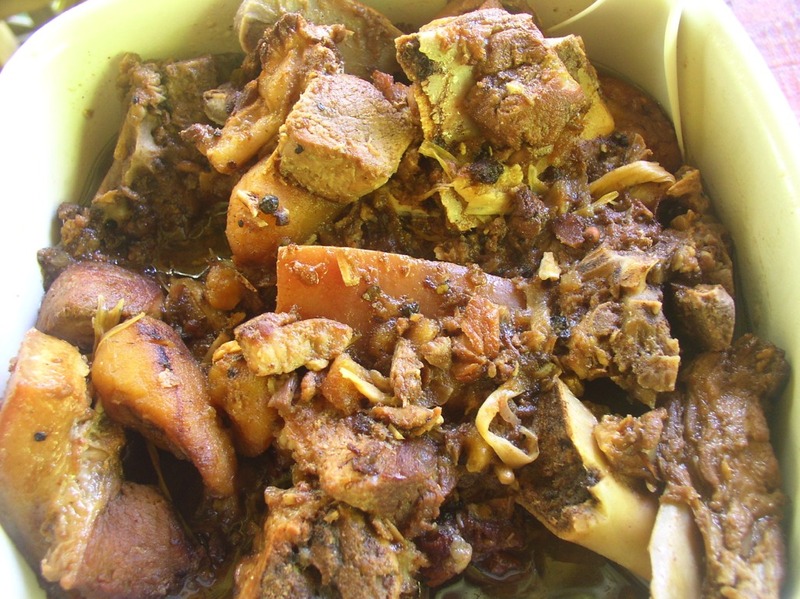 Pork humba, a very popular fiesta pork fare. It is pork cooked in soy sauce, black beans and banana flowers. 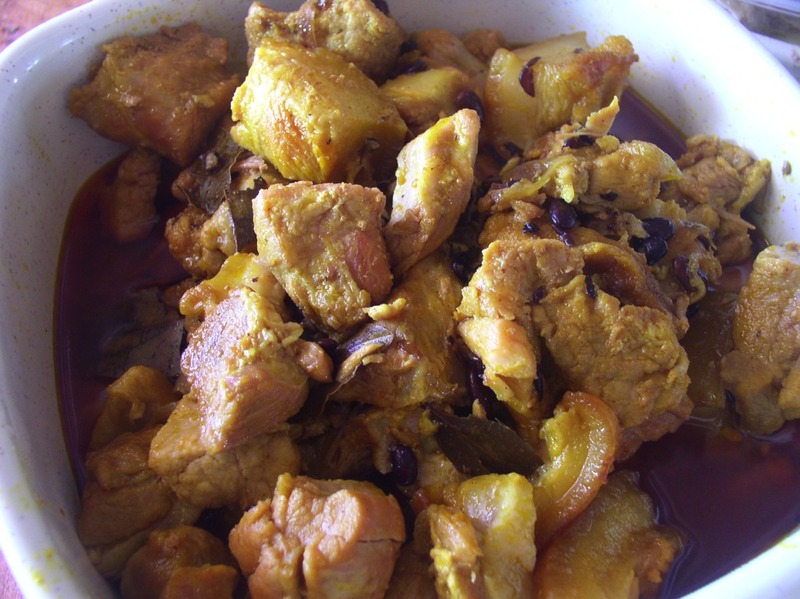 Yet another version of pork humba cooked with carrots and potatoes. 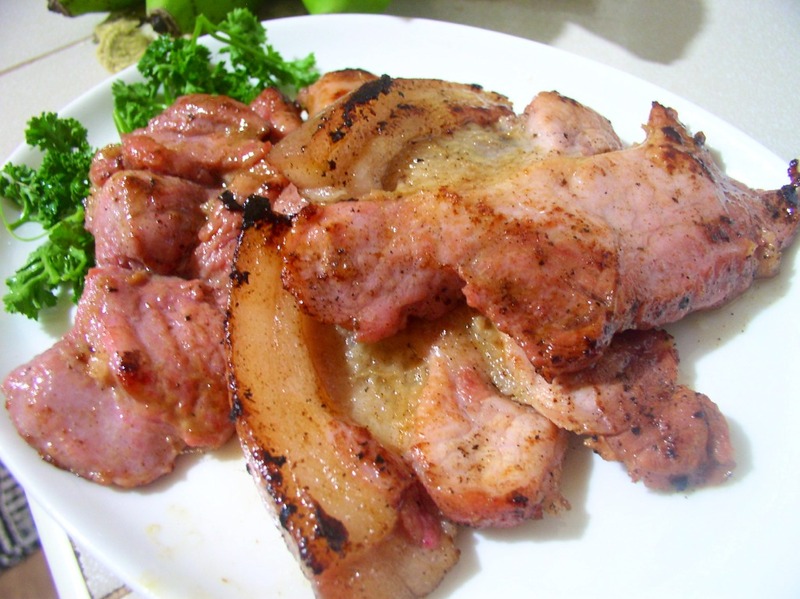 If there isn’t enough pork, people use large cooking bananas (such as carnaba or saba) as extenders. The bananas add a delicious sweetness to the dish. 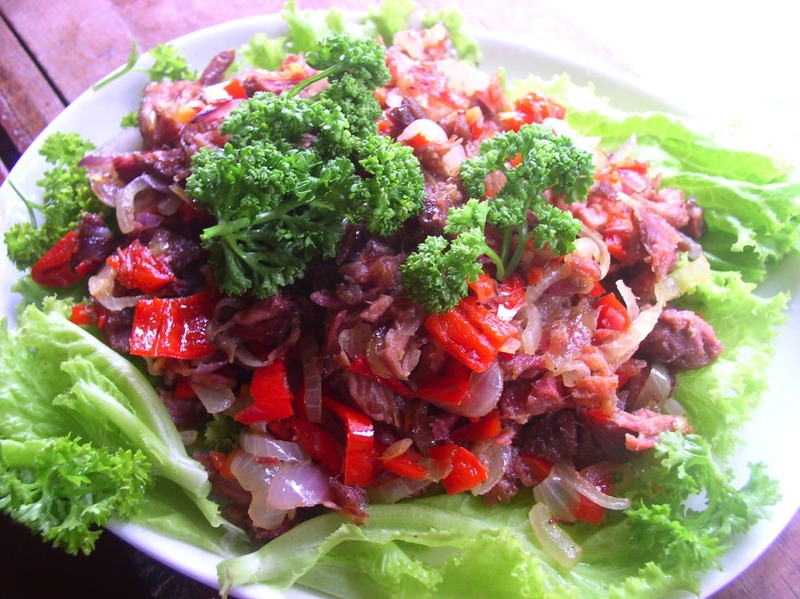 Cured pork meat can also be prepared with salad greens. Here is my version of salted pork. I learned to cure pork to make my our own ham, bacon and sausages. Here’s the cured meat cut into slices and ready to cook! It is best to raise your own pig for meat like this. 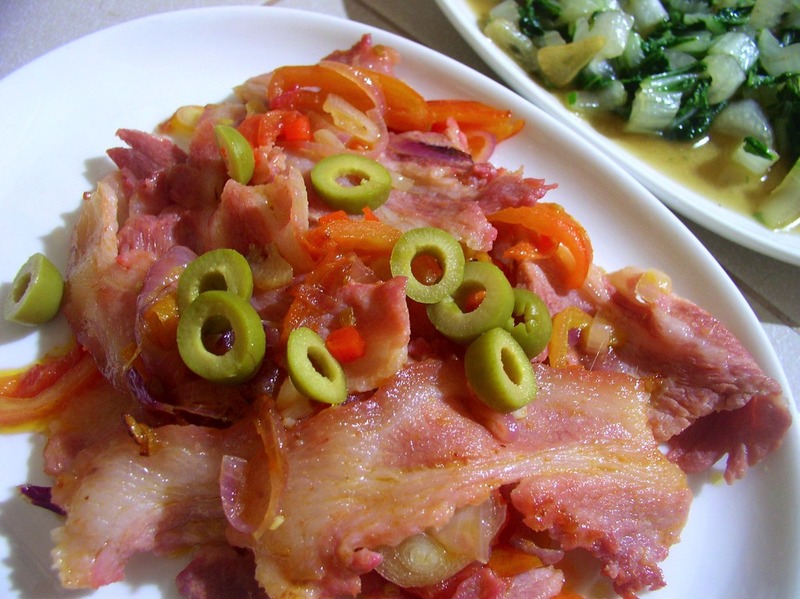 This is home-made sliced ham cooked with some green garnishing. Here’s home-made bacon topped with olives and sautéed tomatoes and onions. I also made meat balls using the ground pork meat. 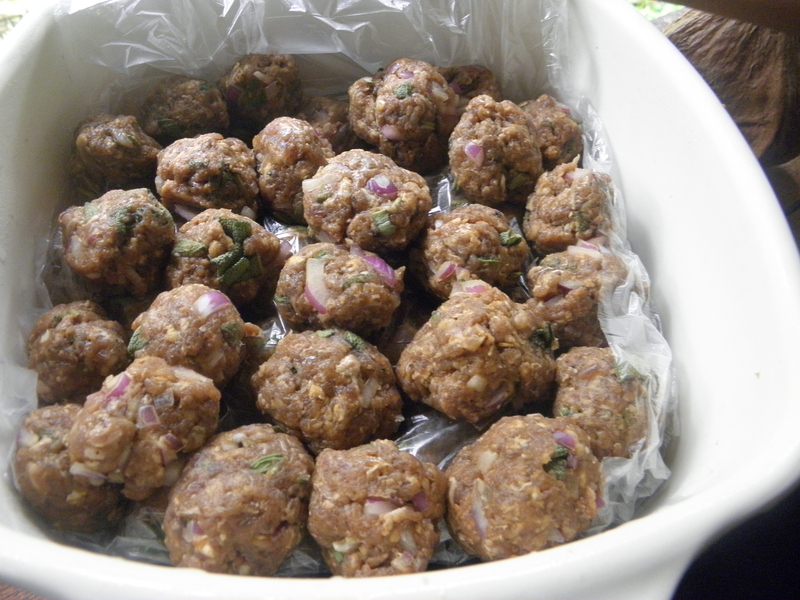 Home-made meat balls is great because you can flavour it with the herbs and spices that you like and because they are mildly cured, they can keep for some time and can be cooked with vegetables, stews and soups. We built a new pig pen, this is two sections, each one big enough for pigs to run about. This way, we wouldn’t have to tie up the pigs so they can have the freedom to run and snout and root on the ground. 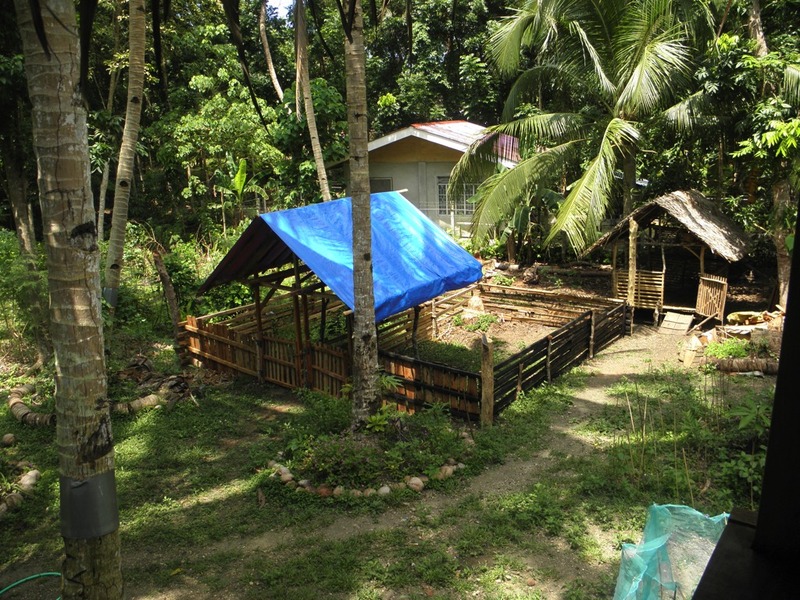 In the meantime, the empty section of the pig pen is being allowed to grow with camote, kangkong, gabi and other such vegetation that pigs can eat. Our sow farrowed in May 2015 but stopped producing milk after a strong antibiotic injection administered by an animal technician. Two months later, she died after a veterinarian injected her with Ivermectin. Such fatalities caused by outsiders is very common in our village thus we have stopped trusting such outsiders. Now we try to do everything on our own. Update January 2019: While we try to manage our pigs as independently as possible, we have established a very good relationship with an animal technician from Breeder’s Agrivet. We are also keeping ties with the Bohol Office of the Provincial Veterinarian. It wasn’t easy! Remember the little spotted piglet? Well she grew to be about 150 kilos and in January 13, 2015, we contracted the services of Artificial Insemination from a fellow in Corella. 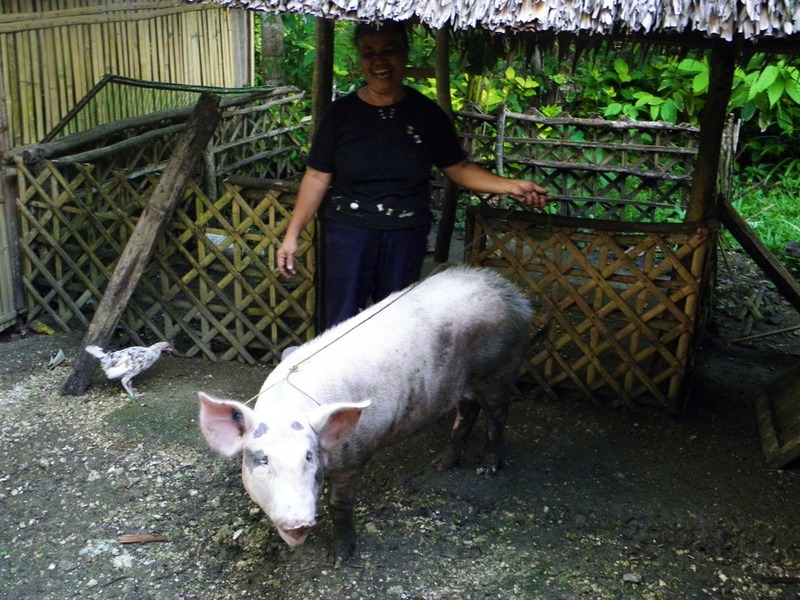 He was the only person we knew in Bohol who had a duroc pig – yes, we wanted a duroc pig! Then in May 9, our sow gave birth to 12 piglets, all on her own without any help from us. Piglets suckling. Later that day, the sow stopped producing milk. The next day we got help to clip the piglets’ needle teeth and our sow received a dose of intramascular antibiotics. The piglets seemed to be suckling with no problems but that was when our problems started. Within hours, the sow stopped producing milk and we had to rear the piglets by hand. By then we had only 5 piglets left (2 were born dead, 2 got crushed by the mother, and 3 more died when the sow couldn’t produce any milk). It was very hard work which seemed to go well until after two weeks, the piglets started seriously scouring (diarrhoea) and one by one they died and we were left with one, a spotty brown pig we call Bootleg. Our ordeal had not ended there. At two months, we noticed that Bootleg’s prepuce started getting bigger. It was umbilical hernia. Here’s my 4-month old boar Bootleg. He has umbilical hernia as well as two cysts the size of large marbles in his prepuce. Some two months earlier Bootleg had hernia repair surgery but the hernia returned after two weeks. So now I just try to look after him as best as I can – this means feeding small amounts but frequently and making sure that he has no stomach problems such as diarrhoea or constipation. Update: Bootleg died in September 2016. His son, Pinky Boar, is now the biggest, happiest and most good-looking boar in the village! 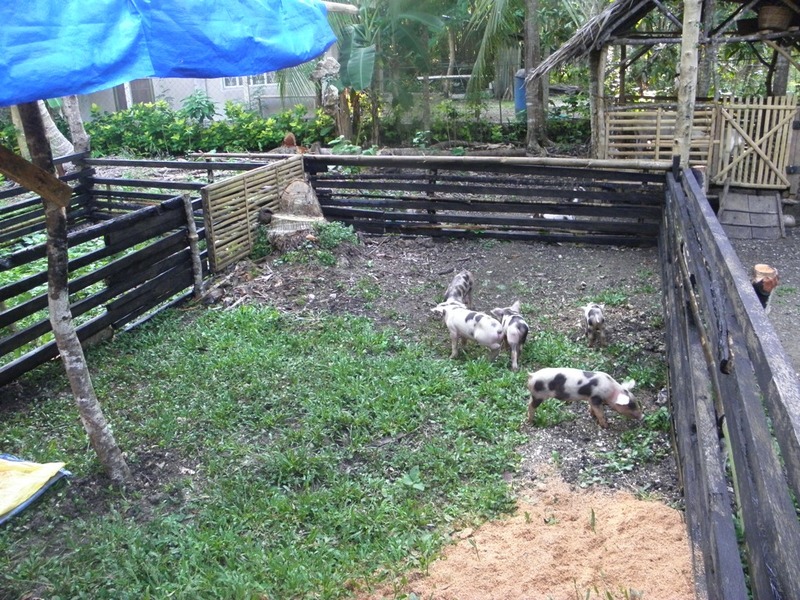 Here are new piglets – about 1 month and 14 days old – enjoying the spacious pig pen. We got these from a guy in the village who has a sow (he got his sow on a third-share investment scheme). Some two weeks later, the grass in this pen is nearly completely wiped out by the piglets! Some pigs are obsessive with a behaviour called “belly nosing.” We were able to manage this obsession by giving them a ball (Trevor’s fantastic idea!). Here’s a video showing how a pig can enjoy playing with a ball. I love it. The pictures of the food make me hungry. The real life depiction of small scale farming is very educational both on a practical and emotional level. As always I appreciate that you portray the whole process.